Connect : Jason Gillespie, Mark Boucher, Tony Mann, Syed Kirmani, Nasim ul Ghani…. Do you know that in yesteryears, Fire insurance was tariff business ~ there was a basic rate – where factories worked in shifts, there was night-work extra premium charged !! ~ and those factories employed security known as ‘night watchman’……… now in most apartments and in ATMs (if at all they are employed) – the security personnel are old, retired individuals who can hardly walk fast …. Yet they are employed as Security (Night watchman) and you cannot expect them to be vigilant – most of them sleep well throughout the night too.. In Cricket (read as Test Cricket) – towards the close of the play i.e., in the dusk when you have only a few overs left – at the fall of the wicket, to protect the higher order batsman – a lower order batsman would come padded up …….towards the close of play, their directive is to play out the couple of overs and frustrate the bowlers further the next morning……. It is protecting the wicket in the night and hence called ‘nightwatchman’ in Cricket. In theory, no team would like to lose two top quality batsman in quick succession, when lights are falling and when the day’s end is closer……. There have been circumstances where the nigthwatchman gets out (not able to do what was expected) and the regular batsman forced to walk-in. The list at the start is the batsmen who came in as nightwatchmen and scored a century. Mark Boucher did it twice. Tony Mann did against Bedi’s Indians at Perth in 1977. Alex Tudor (England) was close to making a century as a nightwatchman; he made 99 not out against New Zealand in 1999 at Edgbaston, and was stranded one run short of a maiden test century when the target of 208 runs for victory was achieved. 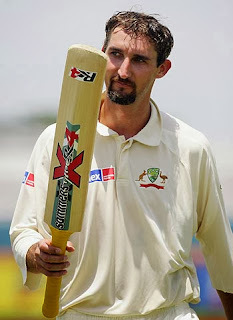 Jason Neil Gillespie played for Ahmedabad Rockets in ICL… played with distinction for Australia in 71 tests and 97 One dayers taking 259 test wickets and 142 ODI wickets… he made 1218 runs including an unbeaten 201 against Bangladesh, which unfortunately was the last Test he ever played. In Test No. 1799 at Chittagong stadium in April 2006 – Australia won by an innings and 80 runs. Jason Gillespie walked in as a nightwatchman at 120/2 – scored unbeaten at 201, taking the total to 581/4.... he thus has the unique distinction of the first (and only one thus far) nightwatchman to score a double-century. Bangladesh made 197 and 304. His figures of 3/11 & 0/14 with that double ton won him the Man of the match as also the Player of the Series….after that series he went in to oblivion and never played for Australia again is the irony !! !